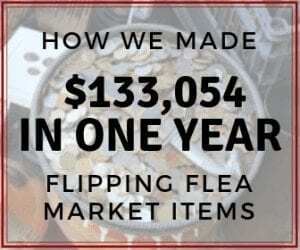 Are you thinking about having a garage sale, but you want it to be profitable enough to be worth it? 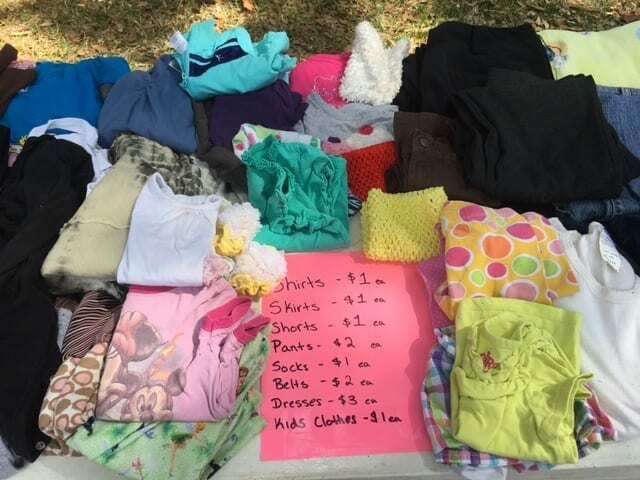 Check out these garage sale tips that we recently used to help us make $913 at our last yard sale! our normal one day. While it had it's benefits, we probably won't do a Sunday sale again. We didn't have very much traffic at all and only made about $40 that day. Our thought process behind three days was that we might as well leave everything set up and hang out for a couple days to sell more and make more money. It's a lot of work to set up and take down a garage sale, and it usually takes us longer to set up than we think it will. We figured this would make the efforts worthwhile, and overall it did. Clearly Saturday was the best sale day, but almost $200 for Friday wasn't so bad either. Sunday's sales were pretty low and we will just stick to Friday and Saturday from now on. 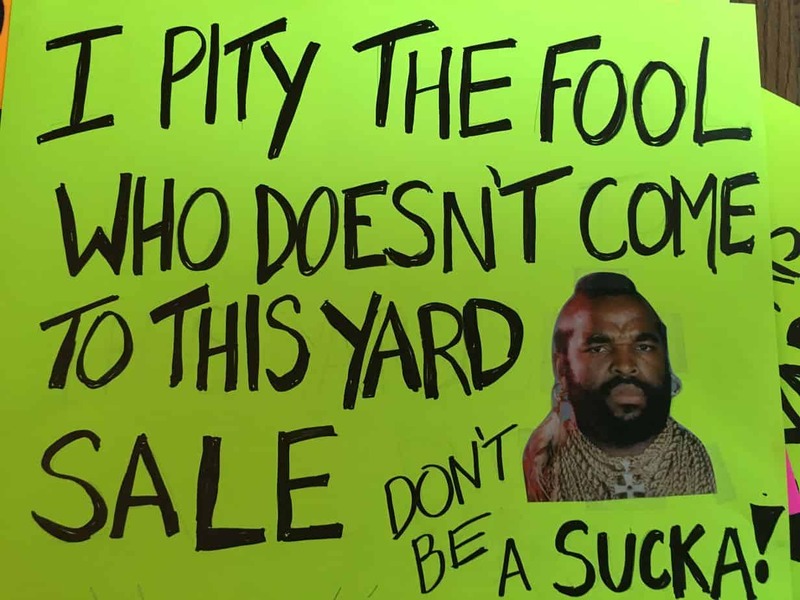 We didn't have a lot of high priced items at this sale either, like we've had in the past. 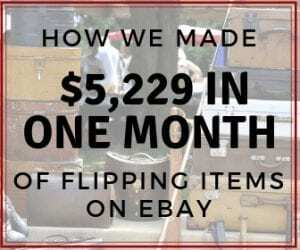 We sold one china hutch for $100, but most everything else was the $5-$15 range, with a bunch of $1 items sprinkled in. 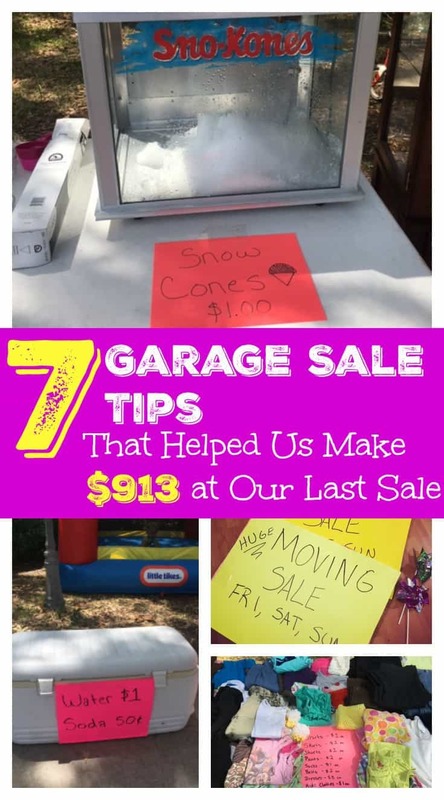 Here are my top 7 garage sale tips to make the most money at your next sale! Check out this method Melissa has been using the past couple weeks. 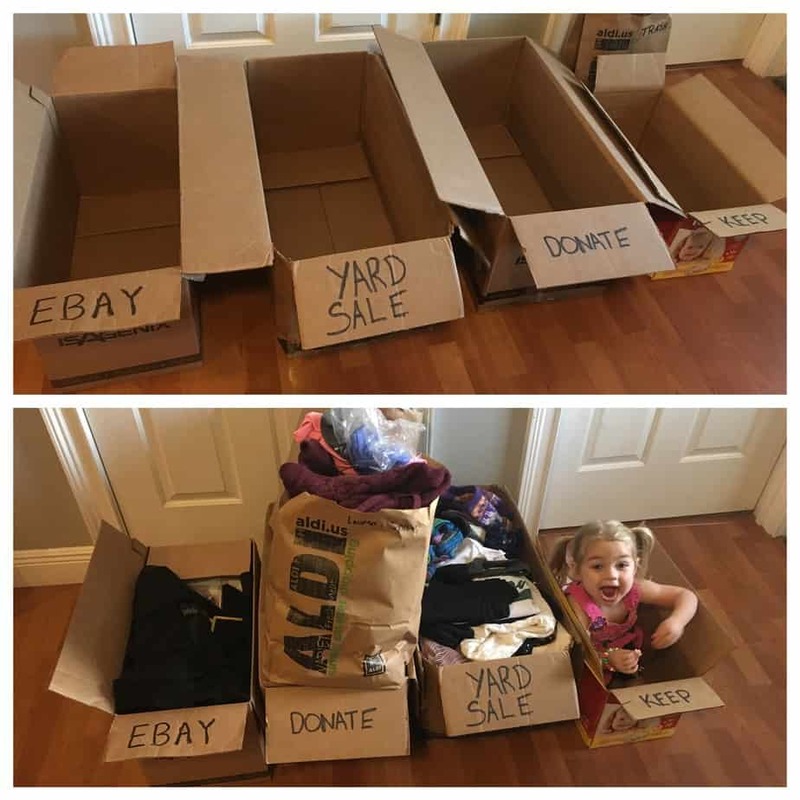 She has several boxes labeled eBay, Yard Sale, Donate, Keep, and Trash. As she goes through an area of the house, she picks up the items and puts them into the correct box. You can read more details about her method on the blog post Spring Cleaning 101: Declutter the closet. It can be kind of a pain to put a price on everything, but it can make a big difference in your sales. Some people don't like to ask prices and might not purchase your items if you don't have them clearly marked. They might want to make an offer, but don't know where your starting point is so they may just pass it up. Having prices marked also saves you some time on the day of your sale, because you don't have to tell every single visitor what a certain item costs. in the office that worked so much better! They stayed on and also left enough room to write something if needed. They were 10x better than the little garage sale stickers that are available. 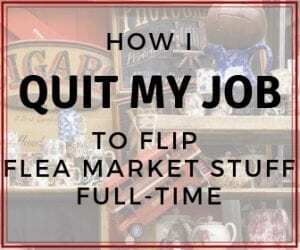 It's true that garage sales can be work, which means not everyone wants to put in the effort. 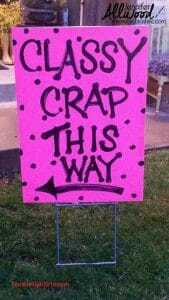 Some of your friends may want to take advantage of your garage sale and put out their stuff too. One of our friends had some stuff to sell, but had to work and didn't want to mess with it, so we made a deal. He dropped off his stuff, we got an idea of what he wanted to get for it (mostly he just wanted it gone! ), and then we split the profit with him because we took care of the sales. We made $160 at this garage sale because of his stuff that he brought and we sold. Definitely worth the effort of selling it for him. Sometimes friends will want to join your sale, which is a great idea too! I wouldn't charge any money to a friend who brings their stuff, sits there all day and sells it themselves. They are just making the sale bigger which is always great to encourage more customers. You can be all set up for an awesome sale, but if nobody knows about it than you won't make any money. 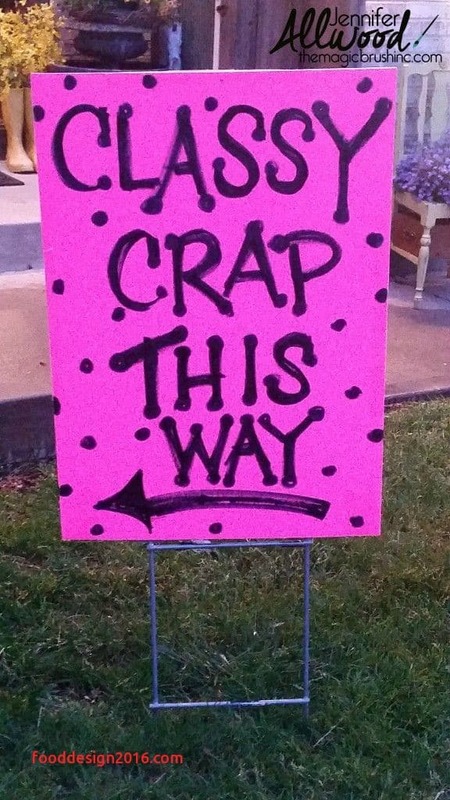 One of the top garage sale tips is to have great signage. We like to make 6-8 to put out on various corners surrounding us. We are located on a little side street, but not far from a couple busier roads, so we place signs on those roads to get attention. 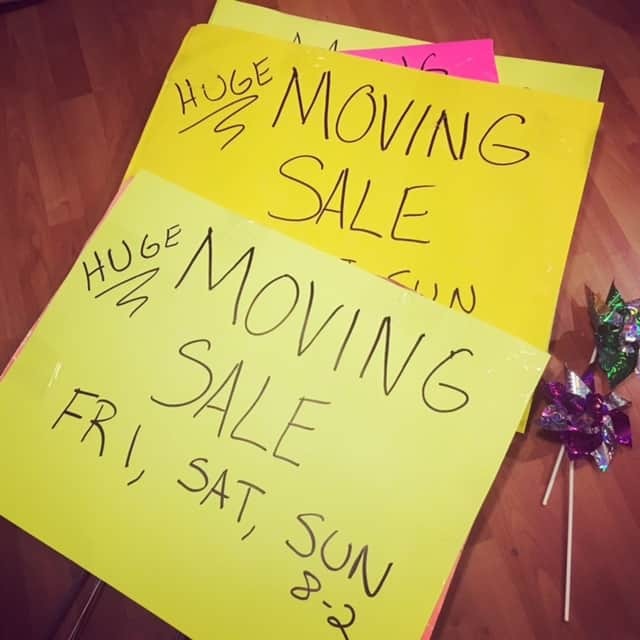 This time we wrote “Huge Moving Sale”, because we are moving in a month or so into our 5th Wheel, and moving sale usually grabs attention. 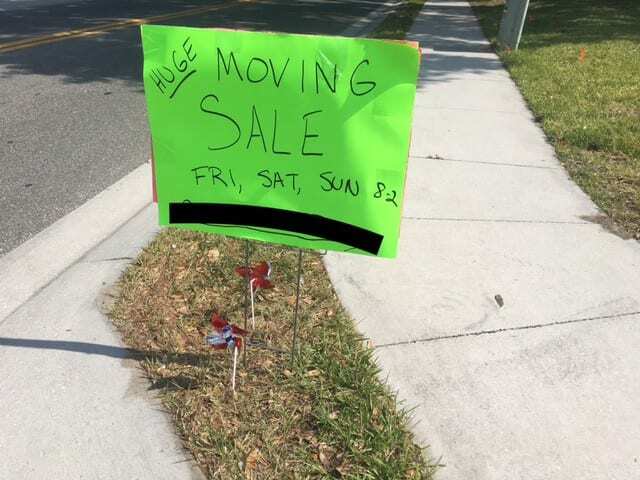 We usually write “Huge Yard Sale”. 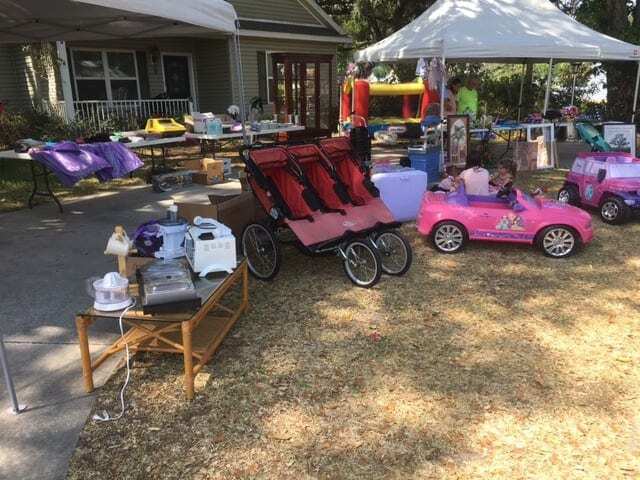 If you are doing the sale with any friends, “Multiple Family Yard Sale” is another great one for people to know it is a big sale and they should stop by! We also like to use something to grab attention from the road. This time we used pinwheels that spun with the wind, and we have previously used balloons and tied them to the signs. 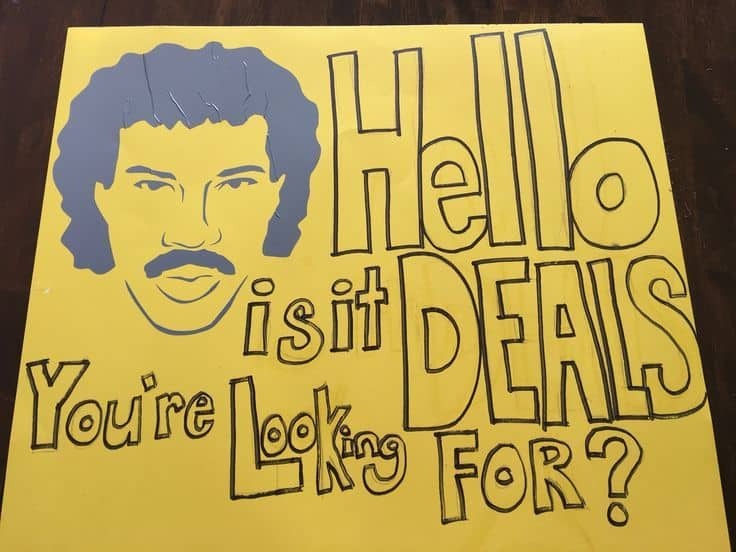 Whatever you can do to get some extra attention to your sign. You have to admit, those are all pretty great! And if you can get the attention and the traffic from them, then it's worth it! 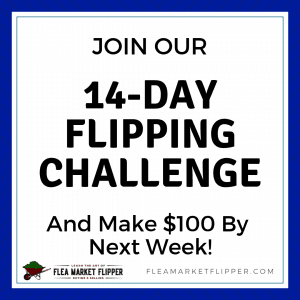 This also goes along with getting people to your sale so you will make some money! 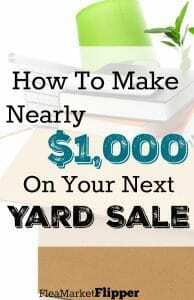 We have had good success posting our sales in Facebook yard sale sites and also on gsalr.com. Facebook reaches a lot of locals if you are in a good local group. The one downside about is people will start commenting about different items that they are interested in and may want you to hold them. 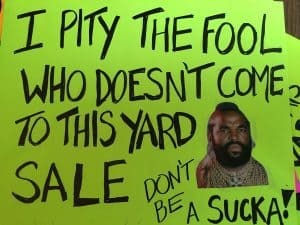 If you are busy at your garage sale you don't have a lot of time to respond to them. 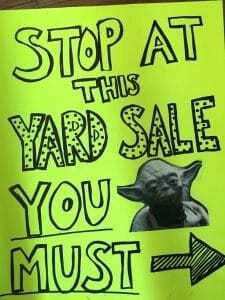 We won't hold any items for anyone on yard sale days. They have to make it in person to buy the item if it's still available. One benefit though is that you can go back after the sale is done and see if anyone has commented on items you still have available. Then you can sell them even after your garage sale is ‘closed'. 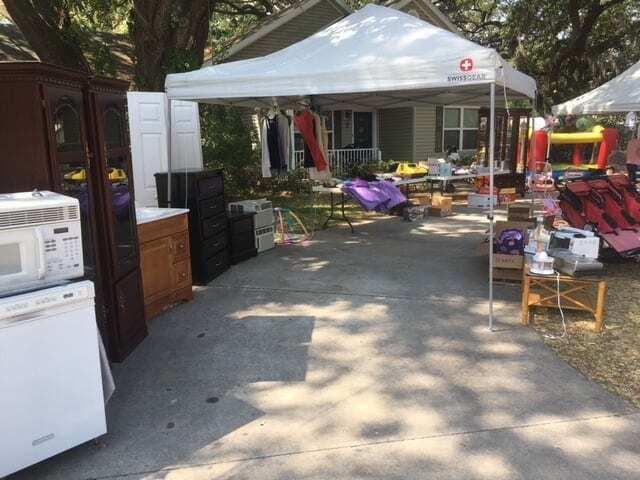 Having an organized sale is one of our top garage sale tips. Your potential customers may not even know you have an item they want if they have to sift through piles of stuff on blankets. We like to borrow a couple tables from our friends because it make a huge difference. Your customers can see your items better when they are brought up to waist height, and will notice more things that they want to purchase than if they were looking at the ground. Here is an example of unorganized chaos. Ha! 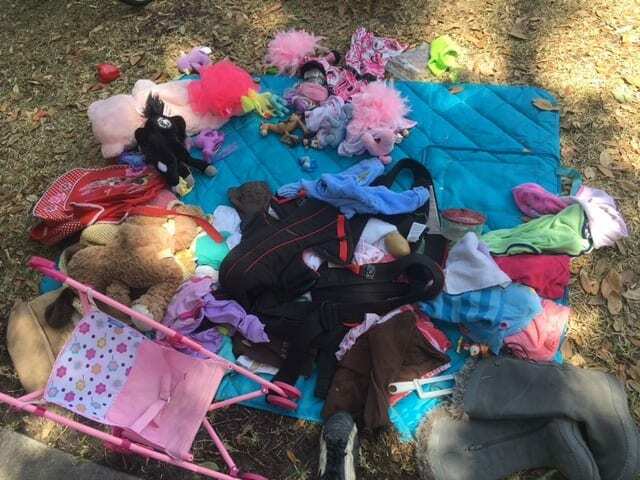 We had one blanket set out where we had a couple of baby items, but our oldest daughter kept bringing out all of her stuffed animals to play on it. It was a mess and looked so unorganized. No one even really looked at that blanket, so we ended up putting things on the table after we made some more room. It's also good to put like items together, and even group things together that are the same price. 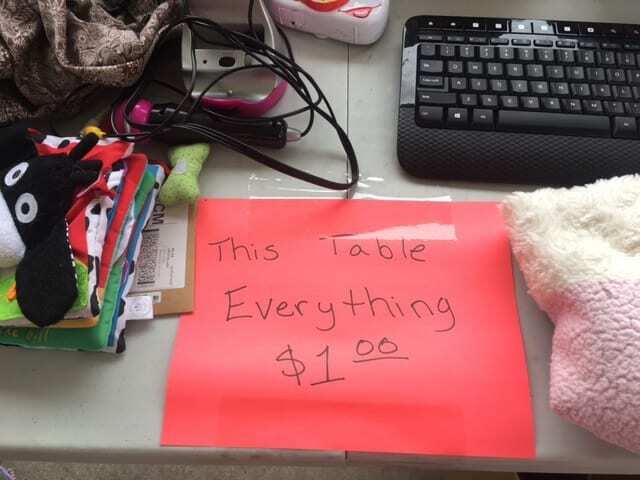 Melissa put a price list out for her clothing table so people can see what everything cost. We also had a $1 table and a $0.50 table. We have done cookies and brownies in the past, but those take a little more work to bake and then wrap in a single serving. 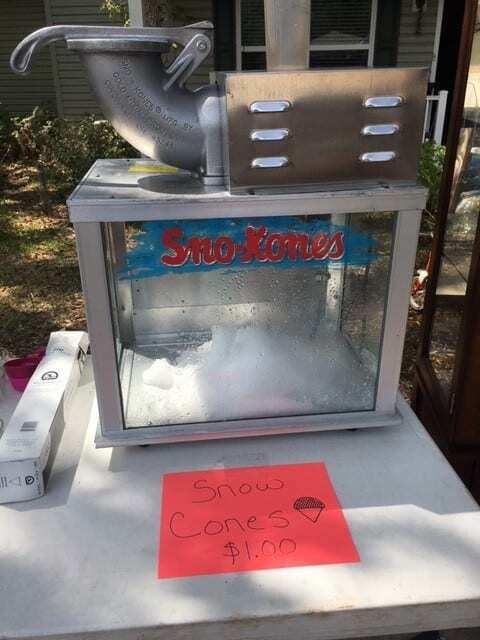 For this sale we had planned to break out the cotton candy machine (a favorite on my garage sale tips list), but since it was so humid we decided to switch it up and made snow cones instead. It was a fun little treat for everyone to have. My niece manned the snow cone machine and she had a great time being in charge of it. Melissa actually made these healthier snow cones by using her natural electrolyte mix (similar to gatorade, but no artificial colors or flavors) for the flavoring instead of syrup. They were a delicious, hydrating treat. 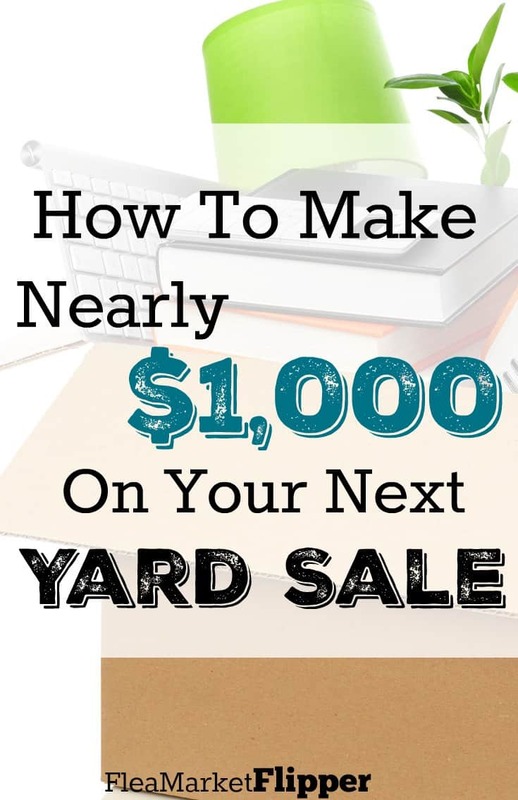 Looking to make some money at your next yard sale using these garage sale tips? Want to know what are some of the top selling items? 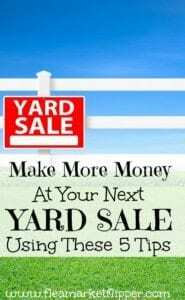 Check out our list of top 6 selling yard sale items HERE. This list is a PDF that will be delivered to your e-mail address in a few minutes. 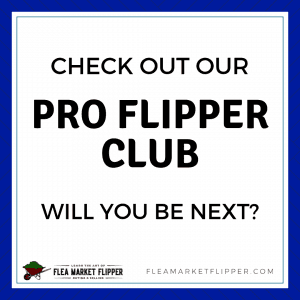 Adding your e-mail will also add you to our flea market flips and eBay tip update list. You can unsubscribe anytime. 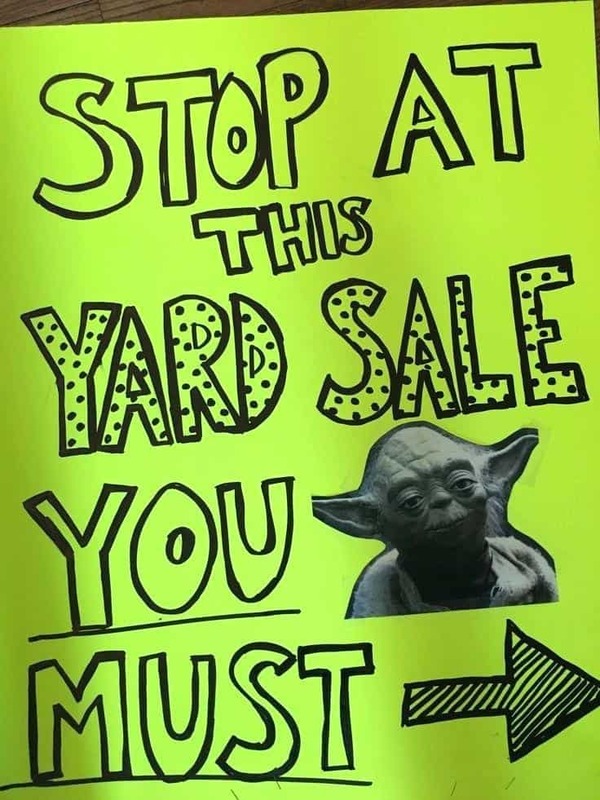 What has been your biggest yard sale profit? 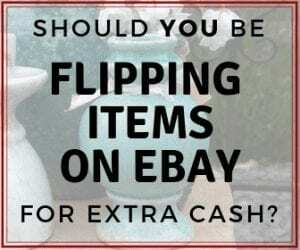 Do you have a tip you would add to our garage sale tips? Comment Below! 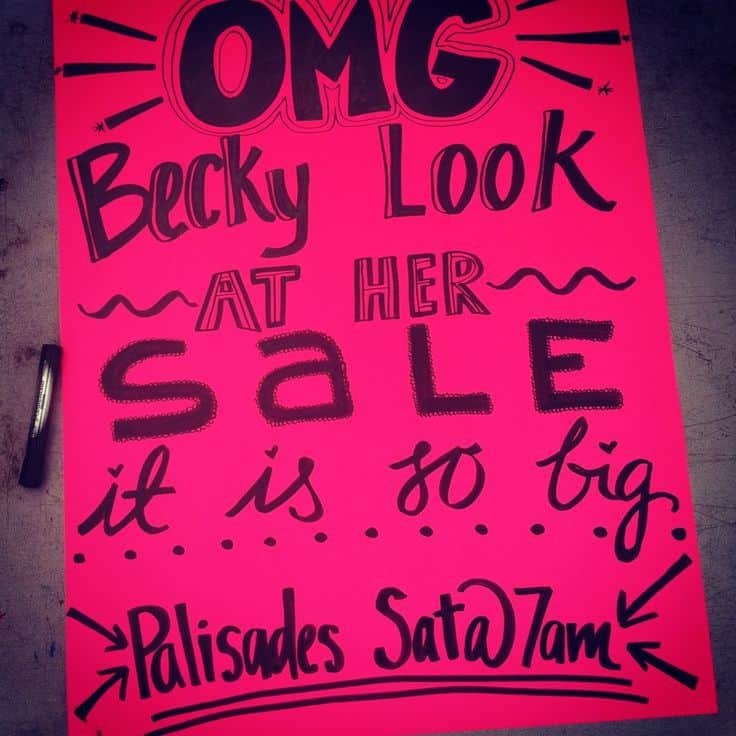 I grew up in the Northeast, where garage sales on Saturday AND Sunday, were the norm. Now living in Central Florida, I find that many people prefer Fridays and Saturdays. 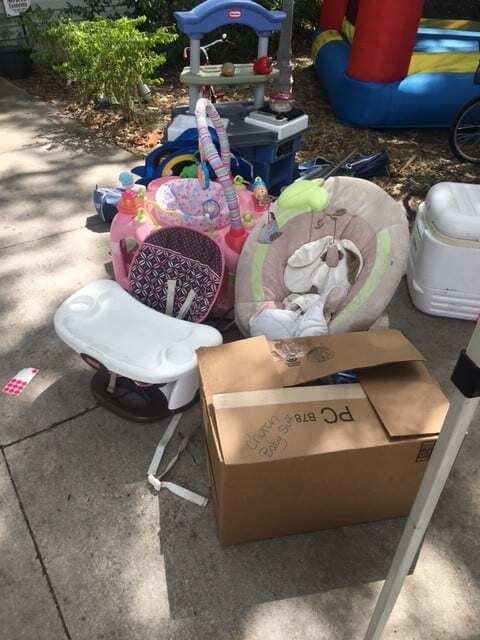 The last Garage sale I did, here in FL, we made almost $1K for the weekend. We had some higher priced items like a vacuum and furniture, as well as garden equipment. We laid everything small, out on tables. 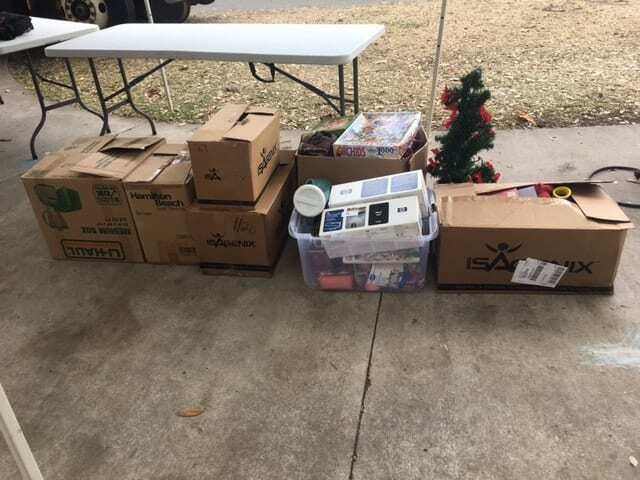 The only things in boxes were “freebies”, which oddly enough, did not go over well. In hind-sight, I wish I were more careful about the small items, like the jewelry and collectibles. Some of these items happened to walk away. And, while they were not really expensive, losing 8 or 10 items, to theft, is disheartening. The night before the sale, we priced everything and layed all the items out or hung them up in the garage. Then, we took a video of EVERYTHING. Every table, every hanging item, every item in a box. It gave us a reference of what we were selling so we could match it up to our records at the end of the sale. 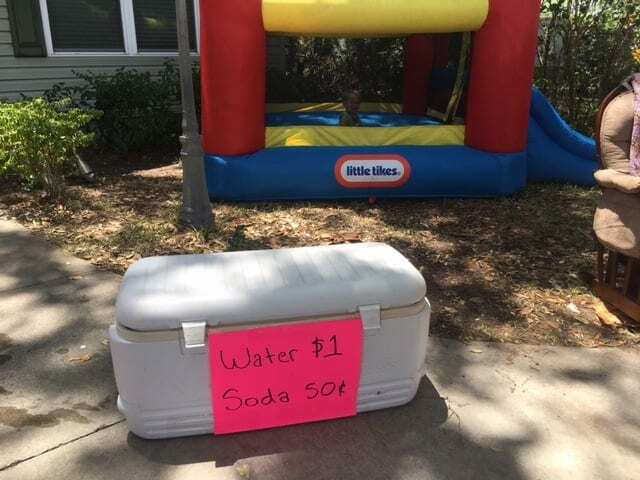 My son was young, so we put him in charge of refreshments (so what if he lost 50 cents, here or there, he was learning and experiencing the art of selling). But, he had the cute factor, so people just didn’t take advantage of him. We had tents up and down the drivway, near the pricier items. It’s hot in FL! This encouraged people to linger in the shade of the tent and (maybe) buy a few more items from those tables. We also played soft music on the 2nd day, because it was awkward the first day when there were just 1 or 2 people milling about. My husband is a great salesman, so he did a really good job with deals and “bundling” multiple items. He also was very diligent about recording each sale. A few things to remember to have on hand: LOTS of $1’s and $5’s. We had signs up that said: “no bills over $20 accepted” and “all sales final”. We also kept a bunch of dollar store batteries on hand-to test items- as well as an extension cord. Shoot, we even had a piece of carpet to test the vacuum on! awesome Cindy! Sounds like you guys are professionals! We are in Central Florida too- and the Friday Saturday thing seems to be the most popular. Great tips on the $1s and $5s handy. We keep an extension cord handy too so people can plug things in. Good luck on your next sale! Keep us posted how it goes! Staying organized helps both the buyers and sellers! I get overwhelmed when I go to a garage sale and everything is scattered everywhere. I agree! When everything is piled on the ground it is so hard to find things!